Chambers joined the team ahead of its inaugural season on a free transfer on Jan. 29, 2016, having last played for League of Ireland Premier Division side St Patrick’s Athletic. Before that, Chambers spent time with Shamrock Rovers, Hamilton Academical, Solihull Moors, Drogheda United, Shelbourne FC, and Waterford United. 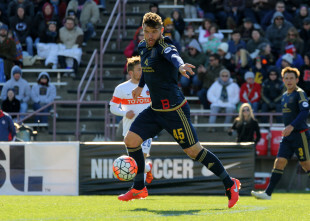 Chambers played 2134 minutes over 27 appearances scoring 3 goals and four assists during the 2016 season with Bethlehem. Without Richter, Chambers is definitely a great guy to have longer-term to help provide stability to a team that’s going to have a myriad of line-ups. Despite just accumulating a full deck of cards during the first season, he definitely showed how good he can boss the midfield. I was thinking the same thing, but I doubt he’d come back without thinking he’d have some shot of the Union IX or at least the 18. He seems to be in this unfortunate situation where he’s good enough to move beyond USL, but not to replace Rosenberry. I’m pretty bummed for him because it was still a promotion going to the Cosmos, and now he’s looking for work again. We don’t know who the Union are going to protect in the expansion draft and what moves they are thinking about. I would guess Gaddis would be protected because he is solid cover at both outside back positions but at the same time, he can’t be happy having been one of the team leaders in minutes played to a backup. Maybe the Union look to move him (possibly at his request) this offseason if an offer is good enough. Then Richter would make sense to come in as the backup to Rosenberry since he knows the organization so well. Then, the resources from the trade, they could look to bring in a younger, longer-term leftback? This right here makes some sense while I don’t want to see Gaddis go this is the way you can bring in backups on the cheaper and younger players to cover in the backline. Brendan Burke said last summer that the longest term contract possible was two years with an option for a third. Might that be what they’ve done? We’ll never know of course. Been assuming they would do this. That they have gotten it done is a relief.